Indie adventures are rather commonplace in today’s gaming scene, and it must be said that the development and publishing teams at Freshly Squeezed and SOEDESCO are going to need to do something either pretty special, or pretty unique, in order to see their game standing head and shoulders above the rest. Thankfully, Defunct is one of the latter. Not enough to see it standing proud as one of the best indie games out there, but most certainly something that is unique. Defunct is all about a broken robot who is left trying to get home – home being the back of a giant cargo ship that he originally fell from. 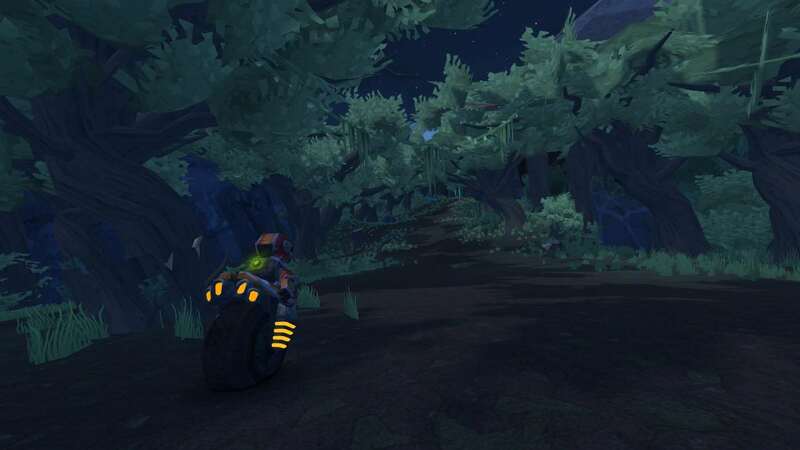 And in order to do so you’ll need to scoot around on your singular wheel, utilise your Gravitize engine and hope and pray that you don’t come a cropper in the process. Yes, I did say Gravitize engine. The entire premise of Defunct revolves around moving from the start of a level to the end of it in style, with a smattering of puzzle thrown in to mix things up. 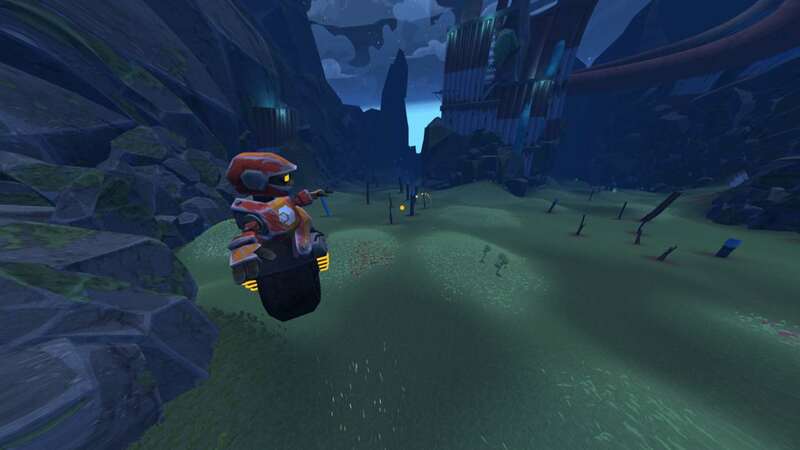 Much of this is done by harnessing the grunt of the Gravitize engine, powering you to glory as you head downhill, and using that movement and momentum to see him climb the upward slopes. It works well too by creating a separate gravitational field around you, with a press of the trigger whilst on the downhill seeing him hunker down and power his way to glory, ensuring that Defunct comes across as a smooth, mound-filled bit of fun. Dare to use it as he starts to make his way uphill though and progress will be stopped in an instant. 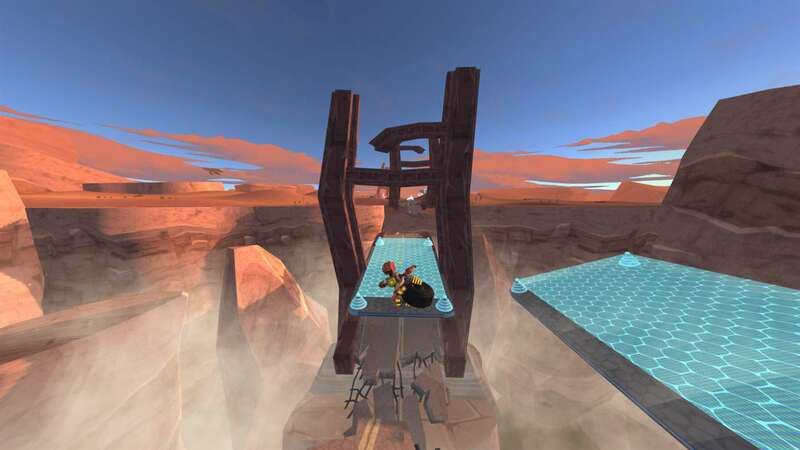 You’ll need to therefore flip between being on and off of that trigger at all times in order to keep the speed required to make jumps, hit springy platforms, pick up collectibles and avoid any source of water. Broken robots don’t like water and landing in the wet stuff will see you transported back to a checkpoint faster than you know it. Thankfully, should you get things wrong or be left crying out for a bit of pace, then Enerjuice speed boosts will ensure you can just about make your way to the next downhill section. If not, you’re left to trundle around at walking pace with only your broken engine to push you along. As you progress through the story you’ll also find your little robotic guy jumping around, before magnetizing himself to structures and being able to traverse things whilst upside down or stuck to walls. It brings something different to Defunct, but this mechanic isn’t used nearly half as much as it could be and just as you start getting into the swing of things, will find that the story you are getting involved in hits its conclusion. Before you reach the end though, you’ll be given the pleasure of enjoying the control scheme; something that is by far one of the most unique in the indie scene. Even though I question the use of the left thumbstick as a combined brake and camera operator, the rest of it all works fine and dandy, allowing for a rhythm to be found and plenty of speed to be embraced. The levels that you’ll need to navigate through are well created too. In fact, the love and planning gone into them is easy to spot with multiple routes all available for you to hunt down and explore. 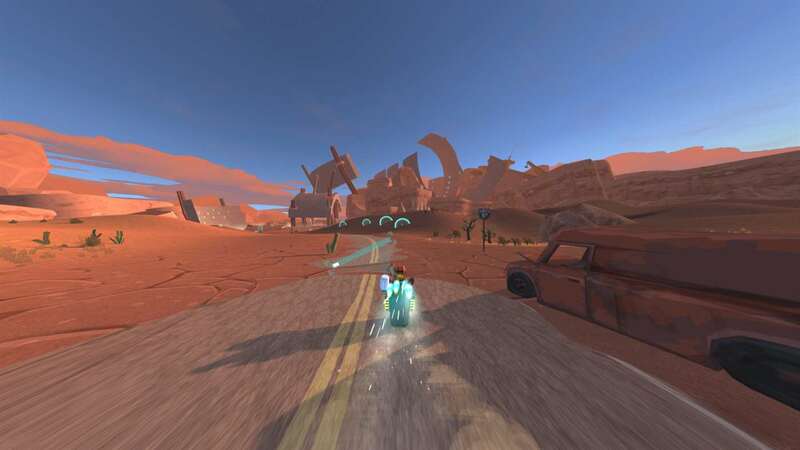 Wide open expanses will need to be explored and this in turn allows for the speedrunners out there to prove their worth, shooting from point to point, and cutting as many corners as possible, in the fastest time. Defunct never really reaches its potential though, what with the short story cutting things off just as it starts to get going. Even though the visuals are okay, there are a number of problems with camera angles and glitches which ruin the whole affair, pushing frustration levels up a notch to a point where they are near unable to be ignored. It’s a shame, because just a bit more time and effort in that department would have ensured that Defunct was a rather pleasant playthrough. The sound is also a massive disappointment with the humdrum of your robot’s little engine and a soundtrack pretty much the only things for you to listen in on. Instead then it is left to the Gravitize engine to bring the joy. Finding the flow is what Defunct is all about and when you do find that it works damn well – running super fast and super smoothly. But when it doesn’t? Well, it all turns into a bit of a buggy, juddering mess. Away from the one hour story and you’ll find that speedrunning mechanics play a big – and rather awesome – part in why you’ll occasionally want to go back to Defunct. Each of the levels have obviously been created with the time trialling community in mind, letting you head back in after completion in the hope that you’ll be able to prove your worth with bronze, silver, gold and platinum rewards on offer. Sometimes you’ll just need to make it to the end as quickly as possible, whilst other speedruns will insist that you pick up a few robot batteries along the way. The variety is good and should you be one of those who hark after a new game that will let you shave milliseconds off your times, then this is it. The inclusion of global leaderboards are also a nice touch – if only so you can spend extra time trying to beat your friends’ times. Defunct isn’t a game that must be played, and the damn camera and poor audio don’t ever breed much confidence. But underneath the issues is a fun little title that is just begging to get out. Should you be able to see past the problems, you will find a fast paced – but seriously short – experience that brings a good deal of fun to the table, allowing you the chance to become one with a rather unique and clever movement system. That is no more true than if you enjoy speedrunning and time trialling. Because that is where Defunct ultimately excels.